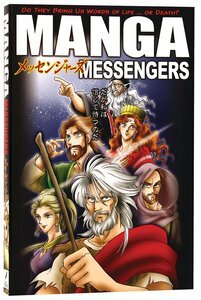 Manga Messengers is a biblically accurate retelling of the prophets?the life of King David to the end of Malachi. These stories from the Bible are presented in the authentic Japanese Manga style. This 5th book of the series to release combines cutting-edge illustration with fast-paced storytelling to deliver biblical truths in a compelling package to an ever-changing, postmodern culture. Over 200,000 books sold in the series! About "Messengers: Do They Bring Us Words of Life... Or Death? (#05 in Manga Books For Teens Series)"